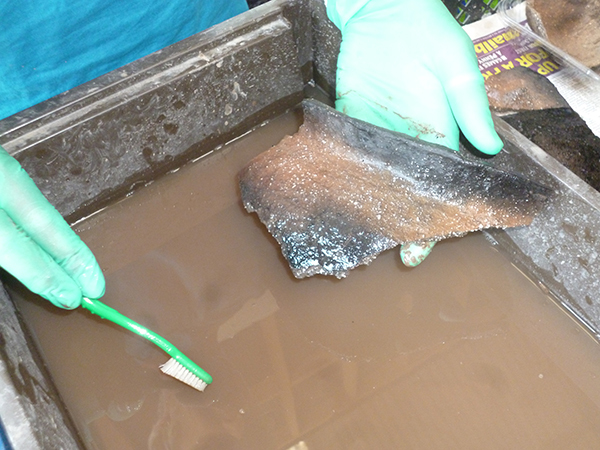 Finds processing can be one of the most interesting aspects of an archaeological excavation project. There’s a chance to see all the finds laid out in one place and set to work with painstaking effort, many bowls of water and an array of toothbrushes to see what’s really under the dirt. 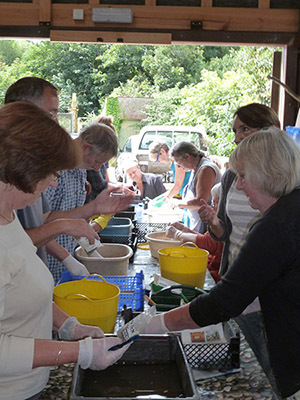 We spent the first Saturday in August processing the finds from a recent excavation in Thanet, including washing the pottery you last saw being excavated in the final image for the VM_365 project. With a big group of volunteers from the Isle of Thanet Archaeological Society and a student from the University of Kent, we made great progress with a stack of pottery, animal bone and stone from the site. There was even a chance to be talked through the key identifying characteristics of the pottery we were washing at tea time. 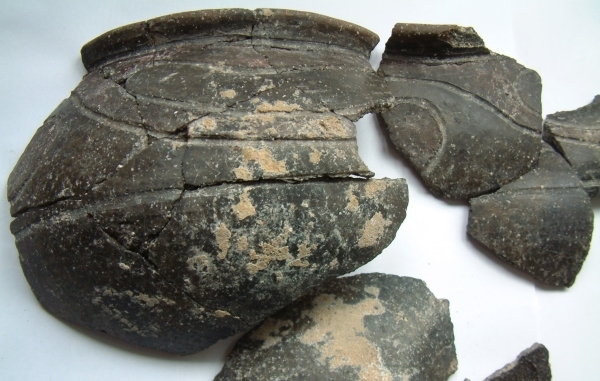 All the pottery from the site seems to date to the Earliest Iron Age, spanning the period from around 950-600BC. There may be a few scrap from other periods but we’ll have to wait until all the sherds are looked at in detail later in the year. It was a beautiful summer day, with the company of old and new friends and there were interesting archaeological artefacts too, what more could you want? Today is Day 365 of the VM_365 project and the final image in the VM_365 series. We have managed to create an archaeological picture and journal post every day for a whole year, come rain or shine. Sadly the popularity of VM_365 project left us unable to post to this Journal for the last three days of the project but we were still able to post to Facebook and Twitter. If you are reading this, we eventually managed to post our final three VM_365 journal entries! But is this the end for the Virtual Museum’s window into the world of Thanet’s archaeology? Not likely as there’s big news ahead and more to come from the new discoveries that are being made in Thanet. Even while we were posting in the last few weeks of the project these big slabs of Earliest Iron Age pottery vessel sherds were being excavated on a site on the south of the Isle. We’re sure they will make a great image in a Virtual Museum gallery post in the near future. 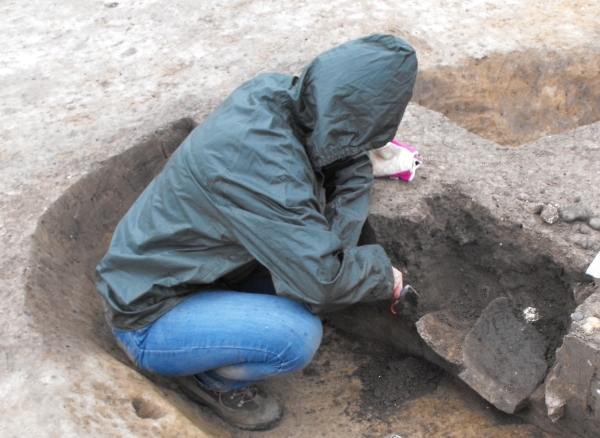 We’ve been pleased to give you this opportunity to share our love of the Isle of Thanet and the archaeological evidence for its past communities, and maybe the best is yet to come! Today’s penultimate post for Day 364 of the VM_365 project features a selection of favourite images from our Curator, Ges. One image that is particularly important to me is the newly minted VM_365 logo which we posted on Day 1. When we launched the project it was difficult to know how much work it would involve, and to anticipate where the threads of each days posts would lead us. I am particularly pleased that like any other Museum we have been able to share events with you, like last year’s Archaeology for You, our table top Beaker burial for a school prehistoric study day which was posted on Day 228 and our recent friendships and fallouts workshops at Bradstow School which was the image for Day 354. The three images are shown from left to right in top row of the composite image, after the VM_Logo. We have also been able to share our knowledge of the work and archives of the Heritage pioneers who first investigated Thanet’s archaeology, like Howard Hurd who recorded so much archaeology in Broadstairs and featured in a post on Day 40. We also acknowledged the inestimable contribution of people like our old friend the late Dr. Dave Perkins on Day 250. These two pioneers are shown from left to right on the second row. New evidence has emerged from the more recent archaeological field work and analysis we carried out ourselves, supplementing the records of discoveries made by the pioneers. A particularly good example is the excavation of a small Roman cemetery at Ramsgate, where a picture from one of the graves was posted on Day 58 and is shown in the centre right of the middle row, confirming the discoveries documented by Ramsgate Surgeon Robert Hicks in the late 19th century, which featured in the post for Day 57 shown on the middle row, far right. Archaeological research has been carried out for nearly 300 years in Thanet and we want to keep that tradition alive and thriving. We have tried to include some images that have challenged the conventional ideas of what archaeological investigation is concerned with. Our posts have ranged from artefacts associated with the Dreamland site like the knife pictured on Day 95, shown in the bottom left corner. Bottles from local soda water manufacturers, such the Phillpot plant in Ramsgate which featured on Day 348 reflect another aspect of the industrial archaeology of the Isle. VM_365 Image sets also looked at the character of our ancient hidden hamlets and the impressive medieval parish churches like that at St. Peters which featured on Day 325. There were also VM_365 posts on the historic landscapes around the Isle of Thanet. Reaching the milestones of the first month’s posts, or the first hundred posts or the unimaginable heights of the three hundredth posts were significant, but there was always so much ahead of us, not always with a rich stream of ideas of what the next post would be. On occasion the last desperate attempt at a post produced one of the most creative and popular articles. It has been interesting to see some of the daily posts begin to evolve into long and related series with cross links and shared themes growing, albeit spread out over time. The story of the burial of a woman in an abandoned storage pit at North Foreland reproduced in the bottom right corner, which began on Day 43, is one that evolved to create a detailed description of the burial over several posts. We have been able to update some cross links as we went on and the VM_365 project will be a network of information and references which we hope will stand for much longer than the 365 days of the project. We will draw on VM_365 to illustrate our work in the future. We are particularly proud that we have managed most of the processes to create the VM_365 posts in house, from managing the web pages to the production of most of the images we have used. It has been a welcome relief to have had supplementary material from some great guest curators to lighten the load of producing a daily post for a whole year. Nigel Macpherson Grant’s contribution was celebrated yesterday on Day 363 and that of Steve Willis on Day 362. Much of the success of the posting depended on the photographs originally created for the Virtual Museum by Paul Hart. All these people gave us a tremendous body of material to draw on when our own knowledge was lacking or our time was short. We’ve also been able to interweave some solid factual information alongside some more contemplative posts. I would like to thank our good friend Nicki, who once mentioned in conversation that she had done a 365 photo project herself, and so the creative wheels started turning at the Trust. Thanks for following and commenting throughout the project as well. Most of all I would like to thank Emma, who shared her favourite images on Day 361, for keeping the project going when the project initiator (!) often wished that the project hadn’t been initiated. It is perhaps worth considering that each VM_365 post has taken around two hours to create and cross post each day. That’s 730 head-scratching, clicking and typing hours over the year. VM_365 was carried out by us entirely on a voluntary basis, in addition to our usual work. I ask our colleagues who didn’t arrive home until late over the year because we had to ‘quickly’ post a VM_365 piece before leaving the office to forgive us, we hope they agree it has been for the greater good! The project more than achieved its aims in adding many people to our community of archaeological friends, but the success also imposed an unexpected destruction test on our website at the last minute. Regular re-tweeters, likers and commenters have supported the project throughout, and among many solid supporters were Andy Mayfield/Archaeology in Kent and Sophie Adams/Tactile Archaeology who could be relied on for a late night like, share or retweet. Our good friend Maggy is a bloggers dream reader, posting kind and encouraging comments and helpful reminders to all that the VM_365 posts were cross platform and there was often more information elsewhere. 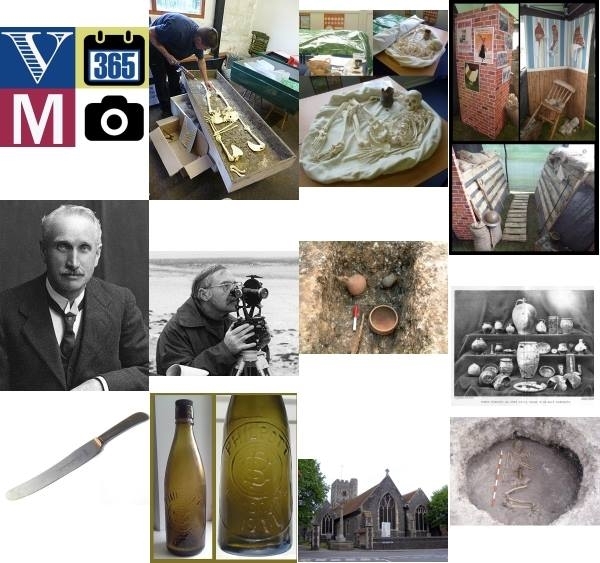 VM_365 is ultimately a labour of love, because we love the history and archaeology of the Isle of Thanet and we’d love you to love it too! 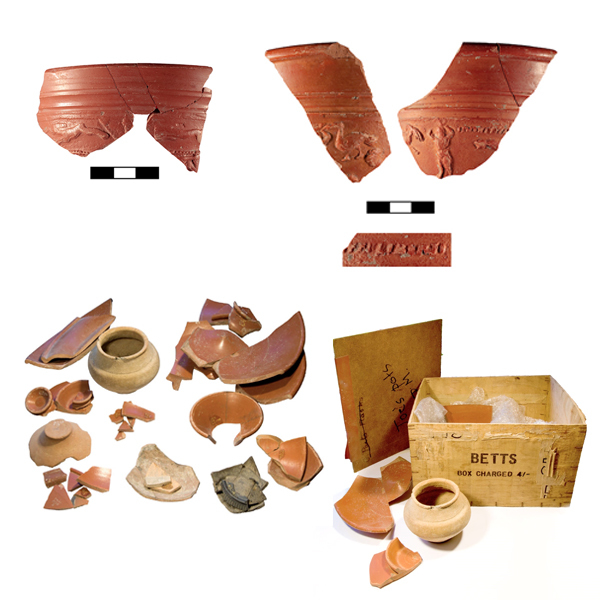 For Day 362 of the VM_365 project we have a roundup of the images that accompanied posts made by one of VM_365’s guest curators, Dr. Steve Willis of the University of Kent, an expert of the distinctive Roman samian pottery which has been found on so many of the archaeological sites of Roman Thanet. Samian vessels featured in several VM_365 posts. Day 297 featured samian sherds from a site at Dumpton near Broadstairs and Day 102 featured a small samian cup from the remains of a kitchen found at a Roman site in Broadstairs. Day 183 featured a samian sherd with evidence for a repair from the same site and Day 54 featured a sherd of samian with a name scratched on the surface. With an expert’s eye and detailed knowledge the assemblages of finds collected by archaeologists can reveal hidden details, even from the smallest elements and Steve’s knowledge of Roman pottery has helped to provide detailed information for a number of VM_365 posts. One of the most extensively excavated of the major buildings of the Roman period in Thanet is the large Villa at Minster, which appeared in several VM_365 posts. In VM_365 posts two samian beakers of the rare Dechelette 64 form, found in the Minster villa excavation, were examined by Dr. Willis. Day 175 of the VM_365 project featured a beaker manufactured in the workshop of Libertus, who was producing pottery at Lezoux in the early 2nd century. The beaker on Day 179 was slightly later, and is decorated with a chase scene. The post also featured an interesting biography of the French archaeologist Joseph Déchelette who first catalogued the samian vessels manufactured in Gaul. On Day 86 of VM_365 the post visited a box full of samian and other Roman pottery, which belongs to an archive of finds and records which has been given to the Trust to store. Steve was able to examine the pottery contained in the box and to give more detail on the forms and dating of the pottery in a later post on Day 345. in a strange co-incidence, the post written by Steve for Day 346 pointed out that one of the vessels that formed the contents of the wooden storage crate was manufactured in the same place, near Colchester in Essex, nearly two thousand years later. The parallel was drawn that the transport of goods a very useful form of evidence for archaeologists! The images that went to make up this round up picture were produced by Lloyd Bosworth, archaeological technician at the University of Kent. VM_365 Day 361 Curator’s Favourites: Producing cloth through the Ages. As we have reached the final few days of our VM_365 posts we thought that it would be rather fun to introduce us to you as the Curators of VM_365 using either our favourite images or a summary of the posts that we contributed over the project. Our Curator today is me, Emma. Today’s image for Day 361 features my favourite four images that we posted for the project. One of my hobbies outside of archaeology is sewing, particularly dressmaking (although do not ask me to take up your trousers or sew on a button which I loathe!). So, it would seem natural that my favourite four images are all implements dating from the Iron Age to the Anglo Saxon period that are associated with the production of cloth. The manufacture of cloth is a process that is largely alien to most people whether they are interested in sewing or not. Cloth, be it natural or man made is delivered to us in bolts of pre woven fabric from which we can choose our fibre, weight and pattern preferences, we can buy it on the internet, by mail order and in shops. Personally manufacturing our own cloth is a practise long forgotten and these artefacts represent the processes involved when producing your own cloth was a necessity. The artefact on the top left is a Roman spindle whorl which previously featured on Day 276 of the VM_365 project. This example was recycled from a sherd of 1st century flagon and would have been used to turn the raw product from fleece into yarn. The Spindle whorl was wedged onto a spindle which was suspended upright from the fibres to be turned into yarn. The spindle was set spinning and the twist travelled along the length of the fibres spinning it into yarn. 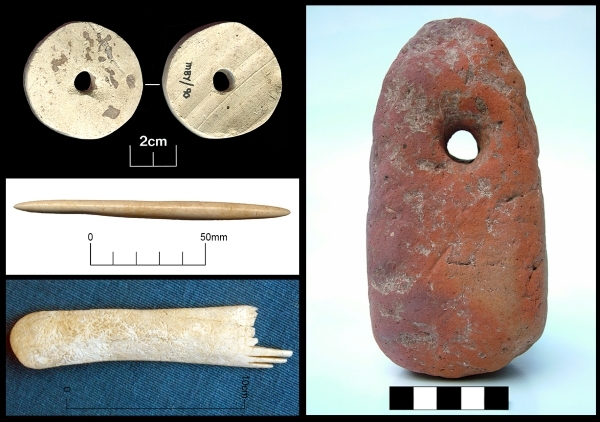 The artefact shown top right is an iron Age loom weight which previously featured on Day 115 of the VM_365 project. This example would have been used in a simple warp weighted loom designed to stand against the wall. The loom weights would have been tied to the bottom of the warp (vertical) threads to add tension whilst the cloth was being woven. The weaving comb shown in the bottom left of the image above is of late Iron Age date and would have been used to push threads into place during weaving. This example featured on Day 110 of the VM_365 project and it is unclear if it had actually been used as the decoration is unfinished and some of the tines are broken. Pin beaters were used to beat down threads while using a warp weighted loom and the artefact shown middle left is a Middle Saxon bone double ended pin beater which previously featured on Day 144 of VM_365 project. The pin beater has been slightly flattened and polished smooth through frequent use. This artefact is my overall favourite, it is a simple object that has seen heavy use and would most likely have been a treasured tool worn over time to fit the hand of the person using it. Today’s image for Day 360 of the VM_365 project shows a series of images of another of our Hidden Hamlets in the Our Thanet series this time from Reading Street, Broadstairs. The hamlet of Reading Street is located on the north side of Broadstairs. The earliest buildings, most of which are located along the main road through the hamlet also known as Reading Street, date from the early 18th century although the hamlet may have had earlier origins; nearby on Elmwood Avenue, east of the main focus of the settlement, is Elmwood Farmhouse, part of which is a 16th century timber framed building. Roughly knapped flint, with brick dressings is the predominant material used in the construction of the earliest buildings in Reading Street with brick becoming the main material used in the 19th and 20th century as the hamlet expanded. White Swan cottage (top left) is an early 18th century house set end on to the road and is built of flint with curved Flemish gable ends edged in brick. Further along Reading Street is a second early 18th century Flemish gabled house, Rozine Cottage (top right). At the eastern end of Reading Street there is also a row of cottages built in a similar style with curved gabled ends which were constructed in 1901. At the western end of Reading Street is a group of cottages dating to the early 18th century (bottom left). One of these cottages, Joss Cottage, is where the legendary local smuggler Joss Snelling is reported to have lived. The end wall of Corner Cottage which faces on to Astor Road is particularly interesting as it features a number of blocked window openings. 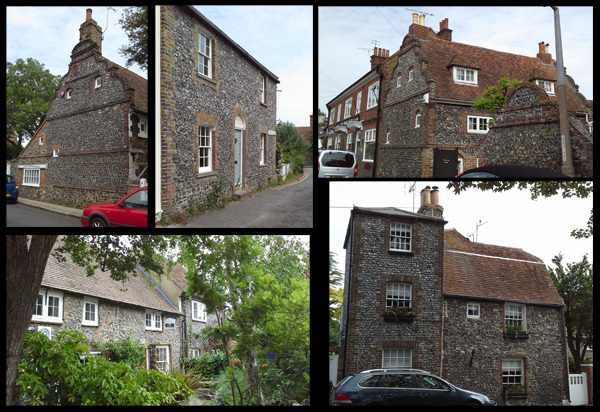 At the western end of the group is a particularly striking cottage with a three storey, early to mid-19th century component built of flint with stock brick dressings (bottom right). Trinity Square is a little side road leading from Reading Street which contains an interesting mix of small 19th and 20th century houses and cottages in both flint and brick. Trinity Cottage on the corner of Reading Street, (top middle) is a pretty example of a 19th century cottage faced in flint with stock brick dressings. Reading Street has plenty of other interesting buildings that have not been featured here including Elmwood, which was the home of Cecil Harmsworth, the famous newspaper proprietor who later became Lord Northcliffe and was Propaganda Minister during the first World War.